Book cover designer with over 15 years experience in custom book cover design and premade cover designs in all genres for print and ebooks. Clients include published authors and publishers whose works are available on Amazon and in major book retailers. As well as first time writers and self-published authors. Illustrated the very first ebook coloring book, Double Dip Penguin Surprise: the Coloring Book that was carried in Barnes and Noble's NY flagship store in 2000 and I was featured in a six-month West Coast signing tour. My work has been published in a variety of media including Time Magazine, Wired Magazine, NPR, XM Radio, WOAI radio, Cosmos Space TV Japan, and Inside Sports Fishing magazine. In 2008, I designed the program for the stage play A Breach of the Peace, starring Edward Asner (Mary Tyler Moore Show, Family Guy) for Habitat for Humanity of Greater Los Angeles. Designed the cover and artwork of FLAWED, for Fox producer and Inside Sports Fishing producer and host, Michael Folkes. which was showcased in Pacific Coast Sportsfishing Magazine. 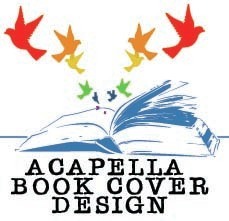 Contact Jennifer at acapellabookcoverdesign@gmail.com and write SUMMER SPECIAL in the subject line to ask about current specials. Along with book covers I also offer headshot photo retouching, printer liaison services, and promotional materials, including logos, bookmarks, t-shirt graphics, postcards, small websites, Facebook Timeline photos, and website graphics. Being a book lover as well as an artist, I respect the craft and dedication that comes with writing. Prices can vary depending on the complexity of the design. Please contact me for a specific quote. For ebook covers, prices start as low as $149, Print covers start as low as $199. I also offer senior and military discounts as well as payment plans.